You probably saw this tutorial coming if you saw my last article Great 404 Pages? 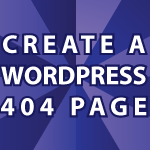 In this tutorial I’ll show you how to make a WordPress 404 page. It will not only be funny, but also informative. If you don’t know, a person is sent to a 404 page if they try to go to a URL that doesn’t exist. If you have a 404 page they’ll see something useful instead of an error page. When I copied this code I got a php error at line 6. When I deleted that line I got an error at line 8. Why would that happen? Do a find and replace with your text editor that replaces the back quotes with regular quotes and it will work. Now that I’ve copied in your code I can’t get my old code back.